Back to School with Walmart best plans and this shop has been compensated by Collective Bias, Inc. and its advertiser. All opinions are 100% mine and mine alone. My son has wanted his own cell phone since he was a little wee one. He’s used mine for several years now whether it’s playing games, snapping photos or calling his Grandma-ma and Pa. He’s always been extremely responsible with our gadgets. At nine years old I’d never actually thought about getting him one until we were shopping for back to school gear and I found Walmart best plans on the WFM Alcatel One Touch Fierce phone with unlimited talk text and data/web. Being a member of the #CollectiveBias group definitely helped with our back to school and finding the best #Phones4School. I didn’t want to spend a lot on my son’s first phone. I was definitely willing to give him say in the matter and get his input on features. I asked him to make a list of features – his wants and needs in a phone. He wasted no time! He quickly jotted down internet, apps like minecraft, weather, texting and calling, take photos and video, wallpaper and Mom wants to track minutes. Yes, my son loves looking up the weather… probably because we live on a farm. We depend on many factors involved with the weather and he likes to stay in the loop. After looking over several phones, the Walmart Family Mobile Alcatel One Touch Fierce Phone was affordable and we were able to mark off everything on his list. The WFM Alcatel One Touch Fierce offers Walmart best plans, is affordable and a full-featured smartphone. My son was able to play around with the phone before we bought it. I wanted to make sure the size would be something he liked and could fit in his pocket and hand. My main concerns were finding Walmart best plans with unlimited talk text and data/web. One of my favorite features of the WFM Alcatel One Touch Fierce is the ability to track the minutes remaining on the phone. My son is nine. He does not need to be on a phone all evening so I want to be able to control costs and with the airtime balance display feature I can do just that. Its battery provides you with up to eight hours of talk time and a standby time of up to 450 hours. My son calls his Pa (my Dad) every day when we are driving to school. Our school is in the neighboring town and it takes us about ten minutes to get there. I love that he enjoys calling his Pa everyday and it’s much funner for him now on his own phone. The WFM Alcatel One Touch Fierce was at an affordable price for us on rollback for $99.88. It’s the perfect smartphone for under $100! We also purchased the $34.88/month unlimited talk, text and web service plan. It’s the perfect plan and phone combination for those who want to stay connected while on-the-go. My son is definitely on-the-go! My son now has a reliable phone he can use for after school activities, taking photos, videos and chatting with his Grandma-ma and Pa. Chatting with friends on the phone hasn’t happened yet… maybe that’s a boy thing! My son stays after school for a lot of activities now and it gives me a peace of mind that he has his phone to give me a call. He is responsible and helps me with chores before and after school. 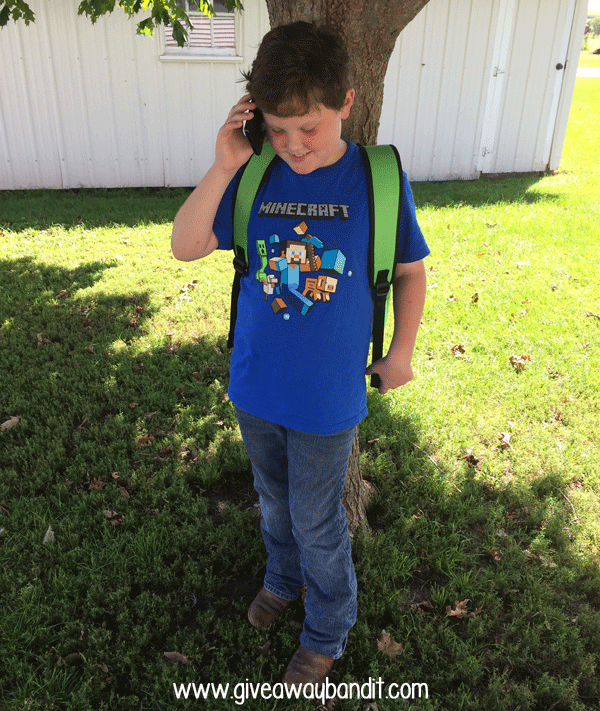 He has earned his phone and it was the perfect time to allow him to have one for back to school time. Of course, he has to earn his time on the phone too by keeping chores done and homework finished on time. Now… it’s time to find a case for my son’s new phone! He is wanting a John Deere tractor one pretty bad but we’ll see what we can find! What features would you look for in a phone for your child? My husband and I always wait and get our electronics (especially phones) on Black Friday. The crowds are a pain, but the deals are worth it! Especially at Walmart! Thanks for sharing the best plans! Always helps when they’re responsible and help with chores! my daughter doesnt start school yet but when she does we will definitely be doing all of our back to school shopping at walmart! Walmart seems to have some great back to school deals! I did not realize that Walmart had phone plans that were so reasonable! My boys don’t talk on the phone a lot either but they would love to have the unlimited data. It’s news to me that Walmart have phone plans and I suspect they will be cheaper than elsewhere. Walmart is always good for deals 🙂 . $34.88/month unlimited talk, text and web service plan I think is super value. Sounds like they have some pretty good back to school deals. I didn’t realize Wal-Mart had phone plans. wow, that looks amazing, i may actually do this now. i dont *need* a phone, but could be useful, out with kids! I also did not know that Walmart had phone plans. Good to know! I’m loving his minecraft shirt! We have shopped for back to school for many, many years at Wal-Mart. It sure beats the running around we used to do to get everything we needed at good prices. My daughters are older now, but this would have been a perfect phone plan for them when they were younger. This is a great phone plan, but my oldest is nine and doesn’t need a phone, my two girls are not even in school yet 🙂 But Walmart is good at being a one stop shop for back to school! I go back and forth on whether to get my daughter a phone. She is nine but it seems like all the kids in her class have one. I am not one to bend because everyone else is doing it but I guess it would be good for emergencies. I mean she has been playing with mine since birth, lol. She knows how to use one. This is a really great post. My son is homeschooled and he is only 6 but he knows how to use my cell phone in case of any emergencies. When he’s older and in high school he can have a phone on him as long as he’s not getting into trouble because of it. Oh and we love walmart! Walmart has great phones. Thanks for sharing! They make them carry sooo much crap every day. I don’t know how they lift all the books. We love walmart we do most of our shopping there what great deals they have. Your son looks like a grown-up! I love the mindcraft tshirt. My granddaughter also loves mindcraft and wish I would find a pink shirt. Thank you for sharing. Wow, Walmart has some really great prices this year! Our daughter has a smartphone (an older one, but hey, it works! ), but we’re thinking about getting our son one soon… Walmart will definitely be on the list! I think this is great! My LO isn’t old enough to hold a conversation yet, but this is great info for future reference. Plus, my contract is ending for myself and I’m looking at various phone plans to see coverage and affordability. Back to school gets so expensive with this stuff! My son is 5 months so I have a looooooooong time before I have to start worrying about a phone for him. My husband and I have a phone from walmart and we like them pretty okay. I would love to have an iphone one day though! In today’s age the internet IS a necessity to assist with school assignments &homework. We shop walmart for our back to school shopping. My son (age 14) wants a phone so I may just look into this for him. Walmart is a good place to shop! I did my school shopping at Walmart also. I have checked over the Walmart Phone Plans and they have some great deals! We are thinking of switching our family over when our contract expires. Your son got a great phone. Most Wal-Marts are open 24hrs. Wait until later, it’s much quieter. a kids phone needs to be dust/moisture proof, good battery life, scratch resistance, and should have a tether attachment. thanks for the post and giveaway! I love Wal-mart and the prices and plans are awesome! I am AMAZED at the price of that phone!! What a great deal for a smart phone! I definitely intend on checking out the plans at Walmart! My son has been wanting a phone too. I was worried about the cost (and if he loses it) Might have to look into this. Wal-Mart has some great deals on their phone. My oldest son has had a phone for years now. I think it’s good for them. Great way to keep tabs on the kids and give some peace of mind to the parents and the child! Some great advice – thanks! These are nice phones, my MIL has a Walmart cell phone. Thank you for sharing with us. I would loook for good mom features such as tracking them so I know they are ok and not doing anything bad with their phones. I like smaller and easy to use phones. Thanks for the information, I have been thinking about buying myself a smartphone but need something affordable, this phone sounds like it would suit my need perfectly. I love Walmart and their low prices! My niece desperately wants her own phone, but Mom & dad say not yet. It’ll probably come from Wal Mart! I don’t know what carriers walmart has up north, but here in the states, walmart has a plan called straight talk which is 45 dollars for unlimited internet, talk, and text. I used to have it before switching to ATT for an exclusive phone. The nice thing is though, after the contract expires, I can take said phone and switch back to Straight Talk and keep my phone and cut the bill in half or more. My son loves to record videos and play Minecraft Pocket Edition on his phone and isn’t to chatty on it! So yeah, I think it’s a boy thing! For my daughter I would make sure that there is unlimited talk and text and that she would have the ability to take photos and videos. My younger brother just got a cell phone and he is 16. I think that is a fine age. We werent allowed to have a cell phone until we had a job, car, license and could pay for everything (including the phone bill) ourselves. I know that things have changed since then but I still feel that there isnt really a reason on why a 10 year old should have a cell phone. My child would just need one for talk, text and pictures. I would look for a camera/video feature and reasonably priced plan. Looks like Wal-mart has both! I love Wal-mart and the prices and plans are awesome! I look for a phone that has a long battery life and is durable. School shopping is a hassle Thank goodness for walmart, where you can get it all in 1 place. This year we bought everything for both boys at Walmart. I love one stop shopping! Thanks for sharing this! Great plans to choose from! I would want safety features such as parental controls and download filters, a camera and GPS. Love shopping there everything under one roof. Shoes are so cute and the clothes too as well as the school supplies we buy. That’s a great price for unlimited text and talk!! I would look for battery life and ease to use when looking for a cell phone for my child. Thank you! haven’t thought about a phone for my son yet since he is only 6, but thank you for the points and insight!